The Rotary Club of York and the District 7390 Southern Tier RMB Steering Committee will host the seventh RMB networking event of the 2018 season and the 43rd in its history on Thursday, July 26 at the York Revolution Stadium, 5 Brooks Robinson Way, York, PA. The event will run from 5:30 to 6:30 with dinner (cash bar) and the baseball game included thanks to the following sponsors: Bailey Coach, Exit Strategy Solutions, Kelly Payroll, Etzweiler Family Funeral Services, the York Revolution and the York County Economic Alliance. The cost will be $15 per person for those who RSVP and will be $25 at the door for those who don’t. Click here to RSVP Now! If you want to bring your children, the cost will be $10 per child under age 12. Contact Rebecca Hanlon of the Rotary Club of York at rebecca@ouryorkmedia.com or call her at 717-405-7961 for more information. Make great connections for your business or project and enjoy the fun and fellowship of RMB. Bring potential Rotarian guests and invite family of Rotary! 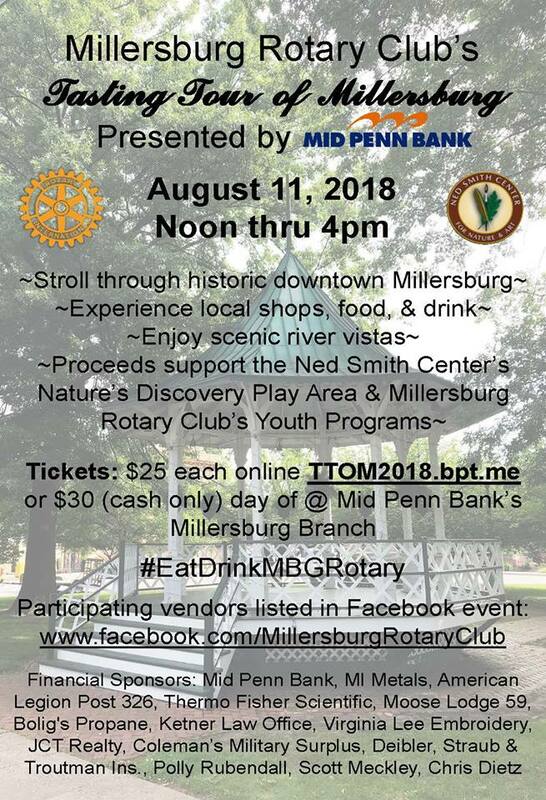 Join Millersburg Rotary Club for the 2018 Tasting Tour of Millersburg presented by Mid Penn Bank on Saturday August 11 from Noon until 4pm. Participants will stroll through downtown Millersburg savoring local food and drink. Enjoy the historic ambiance of our business district and relax along the scenic vistas of River Front Park. Your ticket will unlock multiple venues within one square mile where various locally produced food and drink flavors await. In addition to the samples, food and beverage products will be available for purchase from most vendors. Your support for this event will raise funds to help Millersburg Rotary Club install a Fossil & Prints Dig Pit in the Ned Smith Center's Nature's Discovery Play Area and to support Millersburg Rotary Club's youth programs including: Rotary Youth Leadership Training, Drug Prevention Education Field Trip to the Byrnes Health Education Center, Earth Day Seedling Distribution, Rotary Student of the Month, Millersburg Boy Scout Troop #151. Rotary International supports the eradication of Polio, promotes peace, and strives to make a difference in our local communities and around the world. Tickets are $25 in advance and if there are any tickets left (only 200 tickets will be sold), they will be available for $30, cash only, on the day of the event at Mid Penn Bank's Union St Millersburg Branch. The Rotary Clubs of Carlisle, Carlisle Sunrise and the Northern Tier Steering Committee will host the eighth RMB networking event of the 2018 season and 44th in its history on Tuesday, August 14 at the Hoffman Funeral Home and Crematory, 2020 W. Trindle Road, Carlisle, PA. The event will run from 5:30 to 7:30 with heavy hors d’oeuvres, wine, beer, and soft beverages. The networking event will be FREE thanks to the event sponsor Hoffman Funeral Home and Crematory. RSVP Now!! Make great connections for your business or project and enjoy the fun and fellowship of RMB. Bring potential Rotarian guests and invite family of Rotary! The 38th Annual Carlisle Rotary Golf will be held Monday, September 10, 2018 at the Carlisle Country Club. The event’s registration is 11:30 AM to 12:30 PM with a Shotgun start at 12:30 PM. Complimentary range balls are provided to our players. Soft spikes & proper golf attire required. A fun filled four person scramble will be played to allow players of all skill levels a chance to join in the event. Team awards will be presented. Players may assemble their own foursome or request individual placement. Also awarding prices for longest drive and closest to the pin. Mulligans will also be sold at registration and there will be additional CASH games on the course. At approximately 5:00 pm there will be a cash bar, awards ceremony and dinner along with a sports memorabilia silent auction.